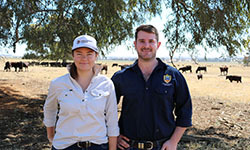 Two CSU students with a passion for the beef industry are set to take part in an internship program offered by Angus Australia and the Graham Centre for Agricultural Innovation. CSU research has found canola meal may provide an option for beef producers to supplementary feed steers and still access premium prices for grass-fed beef. CSU Emeritus Professor Jim Pratley says recent court cases regarding the use of the chemical glyphosate may have significant impacts for Australian farmers and global food security. Two CSU PhD students are set to gain new insight into research to improve the lives of people who depend on rice-based food systems, at an international training program in The Philippines. Syngenta announced the launch of their Australian Seedcare Institute at the International Seed Federation conference in Brisbane overnight, which was attended by Professor Mary Kelly, CSU’s Deputy Vice-Chancellor (Research, Development & Industry). As we celebrate Australian agriculture on Tuesday 21 November #AgDay, Director of the Charles Sturt University (CSU) Graham Centre for Agricultural Innovation, Professor Michael Friend writes about the value of the sector beyond the farm gate and the important role of research across the value chain. Before a steak hits your dinner plate it's aged to improve the flavour but new CSU and NSW DPI research is examining if the process can be done more efficiently. A new agreement between CSU and seven farming systems groups will foster research, development and extension opportunities to benefit farmers, businesses and agricultural students.